London - Rocked by Arsenal's humiliating 4-0 defeat at Liverpool, Arsene Wenger faces a series of damaging transfer window defections that threaten to derail his side's already chaotic season. With the transfer deadline looming at 22:00 GMT on Thursday, Gunners boss Wenger finds himself mired in a mess of his own making as Alexis Sanchez and Alex Oxlade-Chamberlain headline a host of Arsenal stars trying to flee the troubled club. Chile forward Sanchez is desperate to seal a move to Manchester City after rejecting Arsenal's offer of £300 000-per-week to extend a contract which is due to expire at the end of the season. Sanchez, who angered fans when he was pictured smirking on the Arsenal bench during the Liverpool rout, is reported to have asked to be excused from training with Chile this week while negotiations over his future heat up. City are said to have offered their England winger Raheem Sterling plus cash in a bid to convince Wenger to part ways with his prize asset. Wenger reportedly countered by asking City to include Sergio Aguero as a makeweight in the deal but, while Pep Guardiola has shown signs of losing faith in the Argentine striker, it would be a surprise if he was allowed to join Arsenal. City would prefer a straight cash deal for Sanchez, but are believed to be willing to compromise by including Sterling and would fly to Chile to sort out personal terms and a medical before the deadline. Sterling, who was sent off after scoring City's winner at Bournemouth on Saturday, could be surplus to requirements at Eastlands given the array of attacking talent in Guardiola's squad. Sanchez's future isn't the only problem piling up in Wenger's in-tray. England winger Oxlade-Chamberlain has snubbed Wenger's attempts to persuade him to sign an £180 000-per-week contract extension and, with his deal running out in June, he is reported to be on the verge of joining Chelsea in a £35 million deal. West Bromwich Albion are looking at signing Arsenal left-back Kieran Gibbs, while Shkodran Mustafi, Jack Wilshere and Mathieu Debuchy could also be sold. After a miserable first season with Arsenal, Lucas Perez has been told he can leave and the Spanish striker hopes to return home, with Levante among the interested clubs. Wenger will try to off-set those potential losses with some last-ditch shopping of his own and West Brom defender Jonny Evans and Paris Saint-Germain winger Julian Draxler are among his mooted targets. 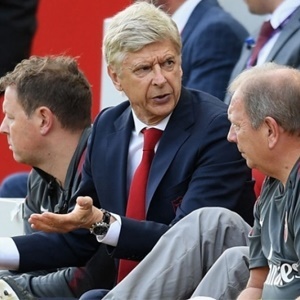 For Arsenal to be in such a panicked state is a huge blow to Wenger only three months after an FA Cup final triumph against Chelsea that the 67-year-old Frenchman hoped would herald a new era of sustained success. The craven manner of Arsenal's capitulation at Anfield, coming just a week after a disappointing defeat at Stoke, laid bare all the flaws that Wenger has been unable to fix in recent years. Without a Premier League title in 13 years and absent from the Champions League this season following last term's fifth-place finish, Arsenal are no longer a marquee destination for the sport's top stars. Now Wenger, who signed a new two-year contract in the close season, looks set to spend the remaining hours of the transfer window in damage limitation mode. And former Arsenal star Ian Wright has seen enough, claiming it's time for his old boss to step down. "Where do we start? The amount of things that are going wrong, it does come back to Arsene Wenger's door. We're three games in and we're literally at crisis point," Wright told the BBC. "Do I think he should go? I would like him to go simply because I do not believe now that Arsene Wenger can motivate those players with everything that's going on above him. "We are three games in and it's already an absolute nightmare."